I must warn you, these spicy seasoned pretzels are highly addictive. Slightly spicy and flavored with garlic and lemon, you will not be able to have just 1. The taste is similar to chex mix seasoning. My future sister-in-law Berleen brought these on a camping trip and they were a hit. We must have gone through 2 bags of these. Lucky for me she shared the recipe. Guys especially love these, so set them out for Sunday football. Football is on Sundays right? Uh oh. Did I just give myself away? Can you tell I don’t watch football? And neither does my Mr, thank goodness. Instead we do really productive things on Sundays…like watch other things on TV. For instance, this past Sunday was spent watching American Horror Story on Netflix. It is so creepy. And silly. And oddly addicting. I must know the story of all the ghosts in that Murder House! ‘Tis the season to feel spooky. 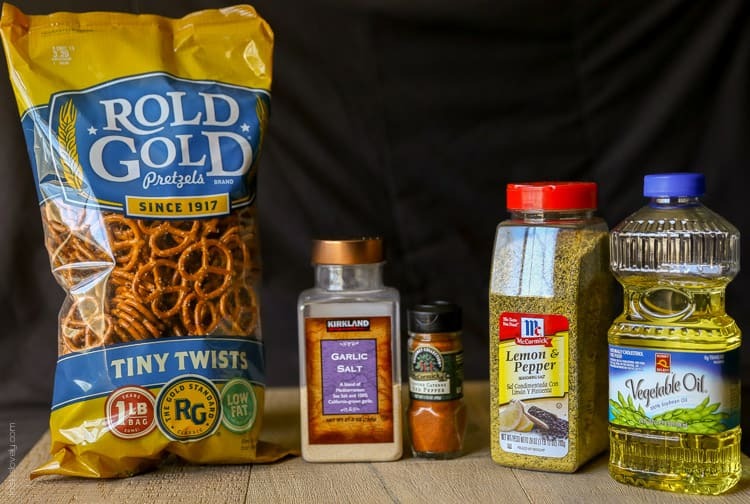 Here’s what you’ll need to make these: tiny twist pretzels, garlic salt, cayenne pepper, lemon pepper and vegetable oil. 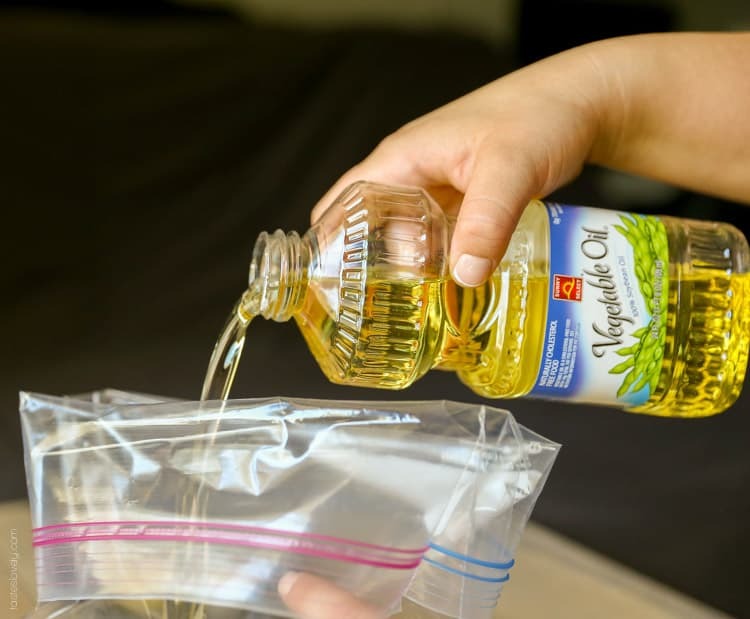 Get a gallon size ziploc bag and pour in the vegetable oil. Zip it up and shake to combine. And shake and toss to get them evenly coated in the yummy seasoned oil mixture. Allow to pretzels to soak up the flavor of the oil for at least 6 hours, 1 day is even better. 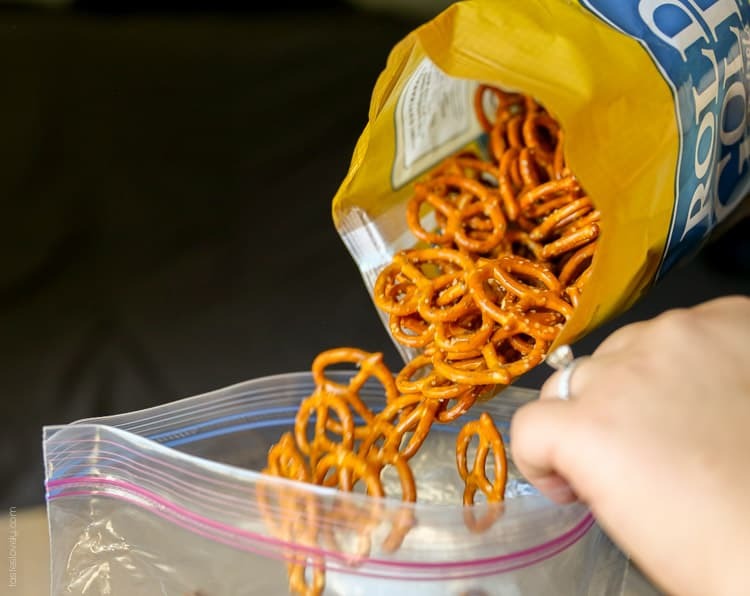 Turn the bag and mix up the pretzels every few hours. It’s worth the wait, because these are de-lish. 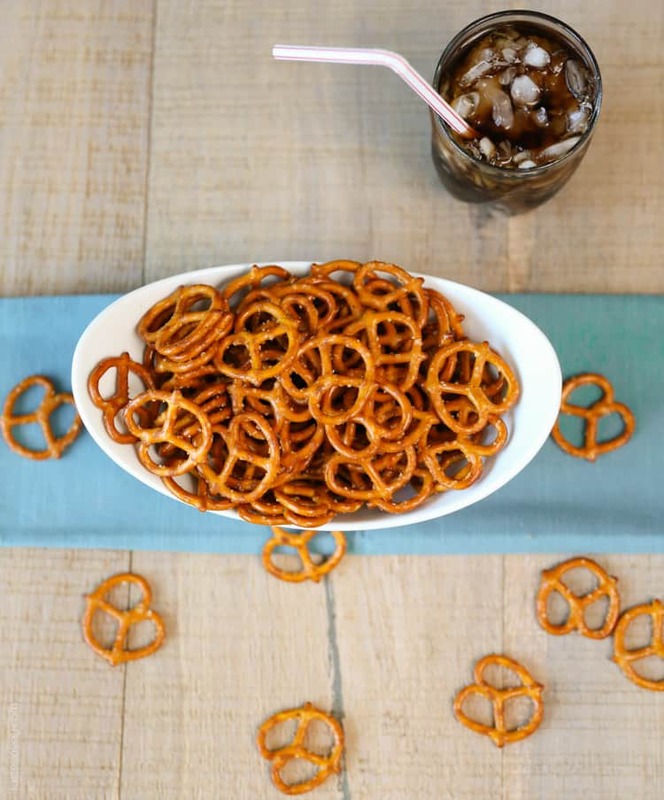 These pretzels…they’re making me thirsty! 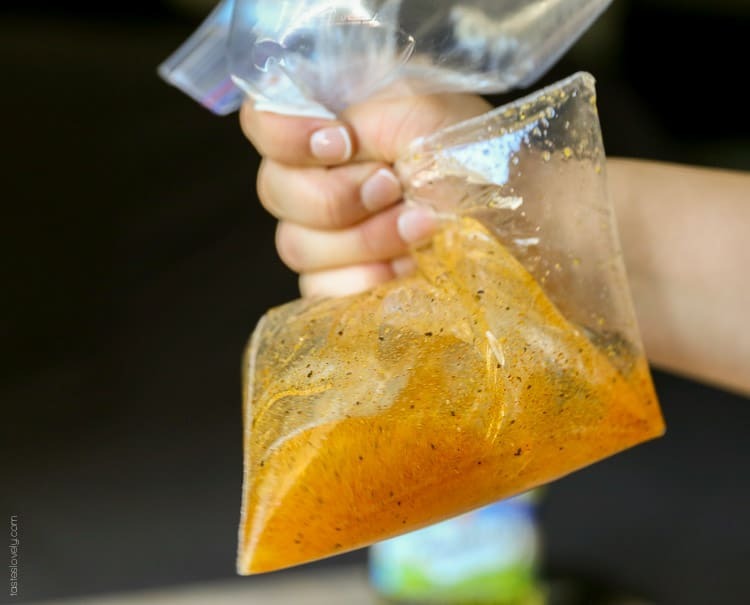 Add in pretzels, seal up ziploc bag, and gently shake to combine. 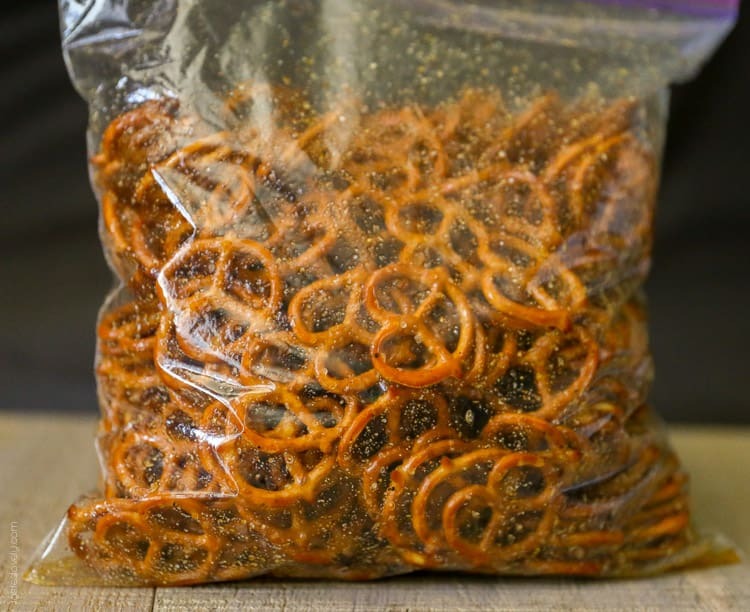 OPTION 1: you can leave them in the ziploc bag and allow pretzels to soak up the seasoned oil for at least 6 hours, or ideally for 24 hours. Turn bag to shake up pretzels every few hours. OPTION 2: bake the oil soaked pretzels in a 200 degree oven for about 1 hour, stirring several times to ensure even baking. Allow to cool before eating. Pretzels will keep in an airtight container for 3 weeks. ah man! i wish i liked pretzels! these look delish! AHH! excited to see this recipe, I was addicted to these during camping xD Beautifully done Natalie, can’t wait to try it out!! Wow…these were delicious! Yummy and so easy! I bet my husband will love these. Thanks for sharing! I’m sure he will! These are a great guy snack. NO WAY could I be trusted anywhere near a bowl of these! They are dangerous! I’ve been eating them camping, and 10 minutes later I’m still snacking on them. Whoops : ) But hopefully all the calories I’ve burned packing up camp cancels them out. Ha! Love seasoned pretzels! I could munch on these all day! What a great idea for creating flavored pretzels! I have to try this! Could crushed red peppers be used instead of Cheyenne pepper? I would think so! Should work fine! This looks like my kinda snack! Thanks Taylor! 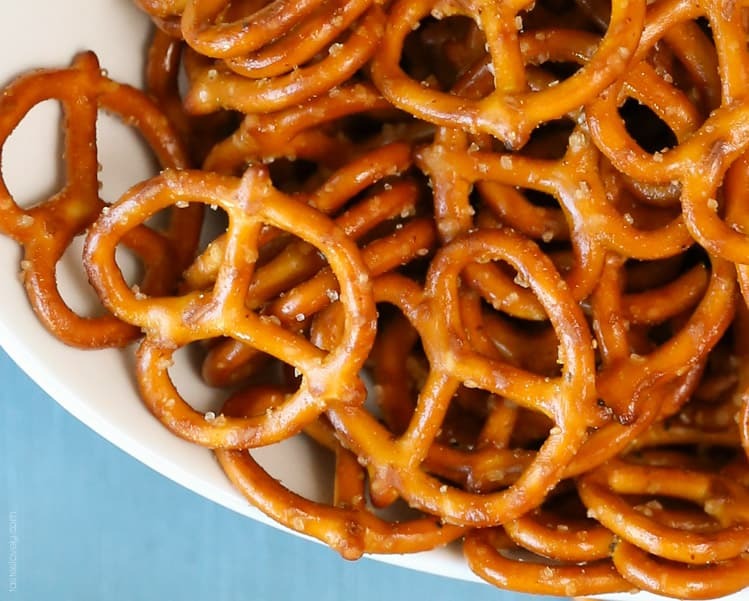 Sometimes I make this an ultimate snack by dipping these seasoned pretzels in cream cheese. Sounds weird, but it is so good! Maybe a little strange, but I think I could get into it! I had something similar to this but with crackers… wonder if you could use saltines as well. These sound Yummo! I’ve seen recipes for seasoned saltines, and always thought this would work for that too. I’ll have to try it and let you know! Have a good weekend! Love this tasty snack! And love Seinfeld too! One of my all time favorate shows! You’re right Amy Jo, it is supposed to be garlic salt, not garlic powder! Thanks for the catch. 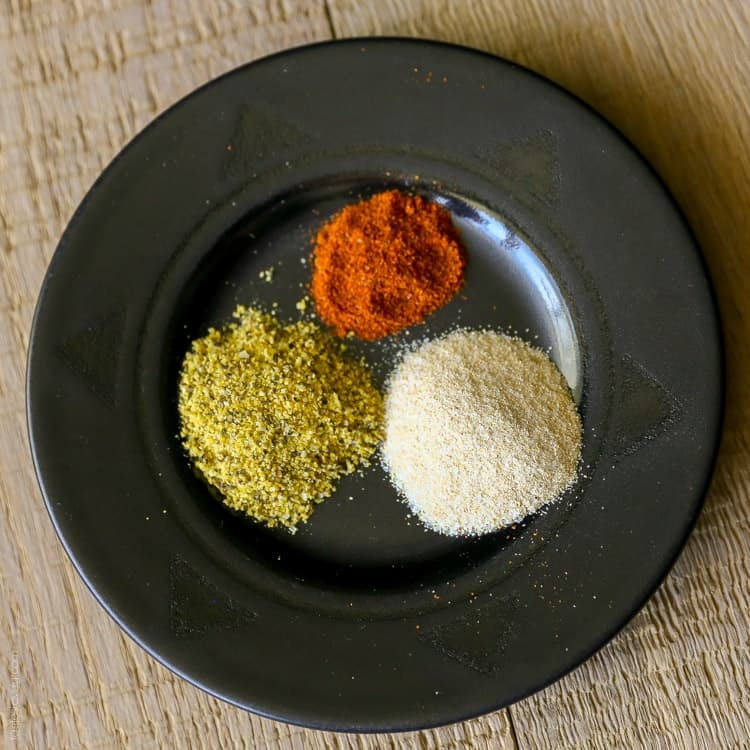 If you only have garlic powder you can make your own garlic salt with equal parts garlic powder and salt. Hope that helps. Have a nice rest of your Sunday! do they have to be refrigerated overnight? is it okay to them out overnight? No need to refrigerate them Gladys. Just leave them at room temperature, on the counter or in your pantry. In a pinch I’ve used olive oil before, it gives it a little bit more of an “olivey” flavor but still works just fine. I usually prefer vegetable or canola oil since it’s flavorless, but if I’m out I’d rather use olive oil rather than going to the store! Haha! Hope you enjoy the recipe. It’s one of my favorites. So addicting! If by any chance there are some pretzels left, how do you usually store them? The recipe I have also calls for a packet of Hidden Valley Ranch Dip mix. 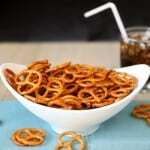 These pretzels are addictive! Made these the other day! They are great. I will say I am not a Lemon Pepper fan so I used Seasoning Salt as a replacement and use Garlic Powder to cut down on the salt. They turned out great and was surprised that they are not oily. Will be making these again. 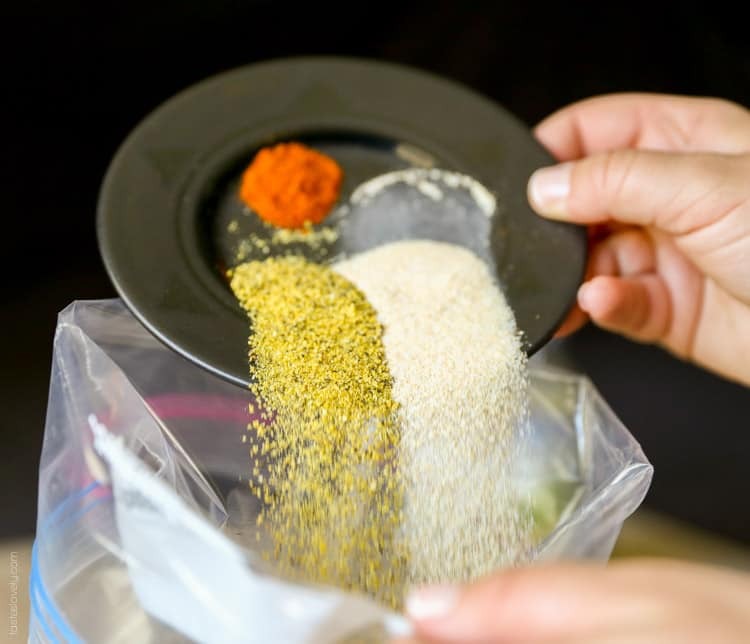 That’s a great idea using seasoning salt instead of lemon pepper Deb! Bet that gives it great flavor. I’m so glad you liked them, and thanks for letting me know. You just made my morning! Have a great rest of your weekend! I don’t see ingredient amounts- can you help? Hi Pam. Thank you so much for letting me know! There was an issue with my recipe display function. All fixed now! You can click back over and it has all the ingredients and directions for you. Have a great rest of your day! These sound delicious but I don’t have any cayenne pepper and I’m not familiar with it to know what it tastes like in comparison to crushed red pepper. Do you think I could substitute crushed red pepper and still get the same kick? Thanks! Hope you like the recipe if you try it! Have a great weekend! I just made this with a whole bag of pretzels but they are still really oily. They have been ‘marinating’ for at least 24 hours. How do I get rid of the extra oil? Maybe open the bag and try to let it evaporate? These are wonderful. I made them a while ago and lost the recipe. I’m so glad I found your site. They didn’t last a day with my husband and I eating them. I was looking for this recipe so I could make them again. Now I just need to go to the store to get the pretzels! These look yummy!! My Mom used to make something similar with a bag of oyster crackers, oil and a packet of Hidden Valley Ranch dressing seasoning. They were delicious and addictive too!! Oh Em Gee! These are FIRE! Thanks for sharing! You’re welcome Elise! I’m so glad you like them. And they definitely have a bit of a kick to it. But play around with the amount of cayenne you add depending on if you want it spicier or less spicy. Have a great rest of your weekend! 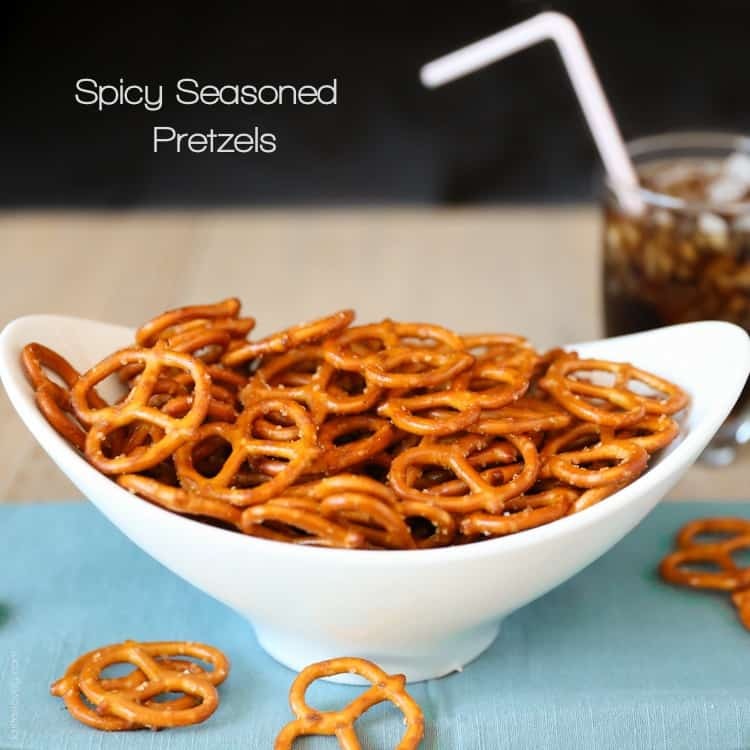 This sounds delicious what a fun way to spruce up pretzels at home. This flavor combo sounds amazing. Great snack to serve at a party! After letting them soak for 24hrs do you bake them in the oven still? After soaking for 24 hours the pretzels should have absorbed all of the oil. I’ve never had to cook them after soaking. But if for some reason yours are still a little too “oily” after 24 hours, roast them at 200 degrees for about 10 minutes, or until the oil has cooked away to your liking. Hope you like the recipe when you try! 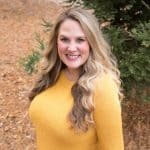 And thanks for stopping by my food blog Melissa! Oh my! These are so good!! I love the tang and the spice on them. They go great with a soda!! Thank you. I’m so happy to hear that Yvonny! These are one of my favorite snacks, and a soda is a must to combat that slight spice. Thank you for letting me know you liked my recipe! You just made my day! You guessed it Skyler! I love that show. We have every episode on DVD. Still watch them all the time. So glad you made these pretzels! They’re so delicious and addictive. Hope you enjoy them! Cajun Seasoning sounds good too! I have to try that. And these are the best snack for camping. I make them every time we go. Hope you love this recipe if you try it! Did not like these pretzels. Didn’t have a good flavor/taste at all!!!!! but that’s what it needs to bee donje before anything else. kind of arena, you should get yourself aware on the risk and possible threat in your online business. Wonderful flavor! I really do prefer this seasoning combo over the ranch dressing. Thanks for the wonderfully simple snack. Perfect for Martini Mondays! Thanks Stacey! Aren’t they addictive. I love them and make them alllll the time. Oooh, and I want in on this Martini Monday’s! Just made these! Nicole brought them along to Murphys and they were just toooo good! It’s going to be hard to wait six hours! Do you prefer them baked or sitting? Yea! You made them! And so funny, because I just made a batch today for our weekend away at the beach. So good! If I have the time to wait, I just leave them in the bag. I’m lazy! But if I want the pretzels right away, I’ll bake them. They end up tasting the same. Hope you liked them! And baby girl liked them too, *wink*! made these 3 weeks ahead for favors at rehearsal dinner for grandson’s wedding. Put in clear bags and into monogrammed $Tree beer steins. BIG BIG BIG HIT! Making today for family reunion (have leftover bags). Putting tags on them. Best snack ever. I am so glad everyone liked them Pauline! This made my day! My family loves these pretzels. They’re addictive. Thanks so much for letting me know you liked my recipe, you made my day! I hope everyone loved them! They are such a favorite for everyone I make them for! I make this every day its very addictive and so tasty whole family loves them thank you so much for sharing!! I’m so glad you like them! Aren’t they so delicious? Thanks for letting me know you liked my recipe, you made my day!